Eric Maldonado makes a serious statement of intent with his 2nd release ‘Against Time’. 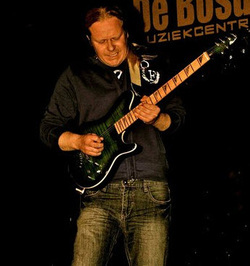 The album represents something fresh for the instrumental guitar realm with its blend of melodic, progressive and ambient metal styling to create the unique Eric Maldonado sound. Eric Maldonado has a melodic but still very shred intense style and on this 2nd album he is showcasing an amazing sense of both songwriting and tasteful yet intense playing. “Against Time” is an accessible album full of strong melody hooks, great guitar work and mature song writing. Great melodies, killer riffs and from the heart emotionally drenched playing are combined with all the insane shredding you’d expect. 01. On The Edge Of Time. This song was recorded last a few days before the release. I tried to create a cool ambient metal song with elements of progressive metal. This song was influenced by Kristopher Carter. This would be the song I would write for a Batman Beyond episode(Kristopher Carter did the music for that show) because it has that futuristic edge to it and it houses some intense riffing and drum parts. This song also features a guest solo by my good friend and dutch guitar virtuoso, Joop Wolters. 02. Ultimatum. This track is an ambient melodic track with some cool synth pads in the background. This song could best be described as "Drums from the 80's, solo's from modern day, and synth pads from the future". A very melodic track for sure. 03. Metallo. Metallo is a high energy, progressive rock song with a very fast groove. There is a lot of riffing going on in the background that really adds to the dimension of the song. The riffing and drums really go hand in hand. This is my tribute to bands like Dream Theater, Racer X, Down From Up, & Second Soul. 04. Renegades. Now this track was GREATLY influenced by my great friend Joop Wolters. It was also the first song written for the album. This one has some cool 7 String riffing and melodic solos. Another one I would do if I was doing music for a Batman Beyond episode. 05. Epilogue. This is the final, ambient piece to this mini album. This is what I would play at the end of a concert, I start out with a pad and a smooth guitar solo and then to a cool groove with the drums and bass, just the way a real solo would be when the guitarist of a live band has his solo. Solo From "On The Edge Of Time"